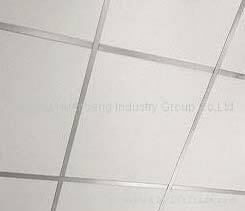 We are a dependable Manufacturer, Exporter and Supplier of Suspended Ceiling Profiles from China. The Suspended Ceiling Profiles, we offer, are equipped with quick lock keyhole system, which facilitates easy installation. Customers can obtain our Suspended Ceiling Profiles in a variety of colors and finishes as per their specific requirements. Talk of price; we are known for providing the best quality at reasonable prices. Suspended grid system features : Works with any 2`x2` or 2`x4` acoustical ceiling tiles - handles interior or exterior high humidity or corrosive environments - low-cost alternative to existing high-humidity systems - eliminates rust and white corrosion - quick lock keyhole system offers easy installation - available in a wide range of colors and finishes - high-grade vinyl eliminates damage and scratches during installation and transportation.